The ability to engage God’s mission in the communities we serve is essential for all who minister in the Church. 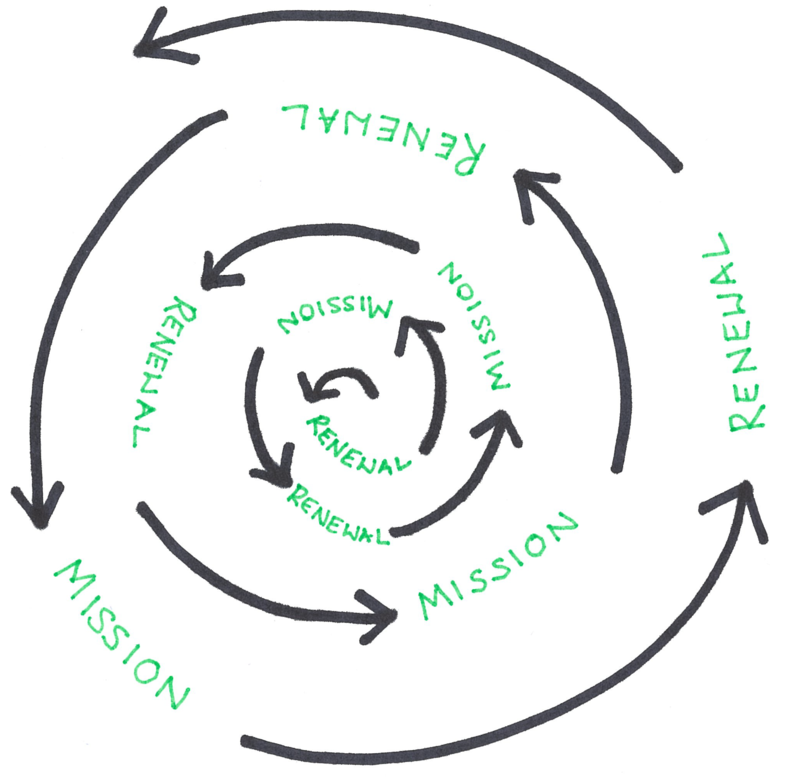 Missional leadership is a priority for Bishop Bell and as such this page will offer a variety of learning opportunities and resources to support the continuing education of clergy and lay leaders in this area. All of us are disciples, and as such we welcome your ideas for workshops, courses, books and resources to be shared on this page. Submit ideas for resources and learning opportunities to Christyn Perkons. Believing that “the best criticism of the bad is the practice of the better,” the New Story Festival seeks to lead us into a better story – one that encourages growth and liberation, healing and harmony; a story where the downtrodden are uplifted and everyone is included. Artists, activists, teachers, practitioners for spiritual/emotional health & wholeness, along with numerous other social innovators gather to share their creativity, practices, and stories at a three-day (Friday afternoon to Sunday evening), outdoor festival of several thousand people on the campus of Huston-Tillotson University, right in the heart of historic east Austin and just blocks from downtown. There will be music, art and stories, speakers and workshops, conversations both formal and spontaneous, helping us step into a better story – one with the potential to transform both Austin and the world. Click here for more information and to register. As part of the Canadian School of Celtic Consciousness program, we offer quarterly events for those attending or have attended our annual July program. John Philip has suggested these gatherings as a means to build on the experience and learning of the annual three-day schools; and to nurture study, spiritual practice, community and action. The Apr 2019 gathering will be filled with the spiritual practices of prayer, meditation, readings, chants, reflective conversation, and time on the land; all framed within our Celtic tradition. Leadership provided by Rev. Debra Schneider and Cindo Peterson. Fees: $50/Shared Room; $80/Single Room; $20 Commuter Click here for more information and to register. Imagine the church as a jar of kimchi (some Canadians think of kimchi as a Korean sauerkraut). What if we spend a day as a group of Anglicans and Mennonites making kimchi, and exploring what it means to live as Christians who are as different from one another as cabbage is to garlic? This workshop involves making kimchi (no experience required) interspersed with prayer, learning activities, and discussions about how to understand and embrace diversity. How can we follow Jesus when we follow His teachings with such variety? How can Christians live in unity even while they worship and believe in many different ways? At the national level, Anglican and Mennonite theologians are engaged in an ongoing dialogue. Meanwhile, at the local level, this workshop will bring participants together in two churches across the street from each other – starting in one church and finishing in the other. A day for kimchi-making and community-making! The workshop leader is Pastor Pablo Hyung Jin Kim Sun. Steeped in the spirituality of Henri Nouwen and Thomas Merton, speakers will present on the foundations and lived experience of peacemaking from the front lines of social justice. Drawing from seasoned activists and peaceful leaders, artists of spoken word and music, this conference will feed your spirit, ignite your conscience, and inspire you to become a voice for peace! Presented by Church of the Redeemer, Basilian Centre for Peace and Justice, and the Henri Nouwen Society. Arrive for 9:30am to sign in. Bring your own bag lunch; break refreshments and snacks will be served. General registration $25.00/Student registration $15.00. Click here to register. “Our Whole Society,” aims to foster a new dialogue about the changing role of religion in a pluralistic Canadian society; the gathering brings together leading thinkers from all sectors of society to create a space for meaningful exploration, where a variety of insights can shed light on the place and contribution of religion in a secular age. In this conference, we are building on an approach to discourse that seeks to draw on insights from diverse religious and secular traditions of thought to navigate the challenges of constructing a society that is more robust and unified amidst its diversity. Our three sub-themes are: Rethinking Identity, Addressing Extremism and Polarization, and Technology, Values and Society. Registration includes two-day conference and lunches. Regular fee $125/Student fee $45. Sunday evening is a free lecture but you must order a ticket to attend. For more information and to register click here . Through workshops, discussions, and the arts, Cahoots is a place to explore justice and faith together. At Cahoots, we will ask questions together, listen to each other, sing freedom songs, practice skills, and create together as a diverse community of faith. At Cahoots, we aim to create a microcosm of the world we dream of. We believe in making Cahoots as accessible as possible. Cahoots is not just a place to consume information, but also participate in transformation. Festival pass – Adult $135 (12 years or older); Child $75 (3-11 years old); Family $400 Day ticket – Adult $75, Child $45 Tickets include all your meals, cabin accommodation, all the sessions and workshops, and support to carpool to and from the site. Click here to register or for more information. This conference seeks to draw together academics, students, and practitioners who are, or are interested in, working with theological approaches to qualitative research, or qualitative research in conversation with theology, concerning the Church and/or churchly practice (ministry – youth, emerging adult, etc, new forms of church, liturgics, congregational music, congregational studies, lived theology, lived religion, and more). Our aim is to be a generative space that encourages research, engaged with the Church and a quality place for, scholars, graduate students (postgraduates), upper level undergraduates, professors and instructors, and ministerial practitioners to present research and work in progress. Plenary presentation by Pete Ward, Professor of Practical Theology, St. John’s College, Durham University, UK, and author of Liquid Ecclesiology and numerous other books. More information and registration details is available here. In 2016 John Philip Newell founded the School of Celtic Consciousness (SCC). He did so in the belief that Celtic wisdom is needed at this moment in time, urgently. It is a Christian spiritual tradition that can nurture vision of mind, strength of soul, and compassion of action. Our daily schedule will consist of prayer at the beginning and ending of each day, presentations by John Philip Newell, followed by meditative practices, silence, and sharing. Meals will be shared in common and there will be free time to hike, swim, explore creativity and art, walk our large outdoor Chartres Labyrinth, and rest. For more information and to registerclick here. A cohort-based program which fosters skills in discerning mission, understanding culture, cultivating formation, and facilitating change aimed at leaders in the church who want to respond effectively to the significant challenges facing the church today. Limited to ordained ministers. The Conflict Management Certificate Program, at the Institute of Peace and Conflict Studies believes that each person can learn how to deal with conflict in a healthy, effective manner. Stress, anger and broken relationships need not result. Instead, conflict can provide an opportunity to explore new ideas and work more competently/productively with others. Enhance your leadership skills and focus more clearly on the mission of the church rather than the conflicts which divide. The program is based at Conrad Grebel University College, , and grows out of the peace and justice tradition of the Mennonite faith.